Spot have 12-15 dusky oblique bars on their upper side. They have a distinct dusky to black spot just behind the top of the gill opening on their body. Body rather deep and compressed. Spot occur along the Atlantic coast in estuarine and coastal waters from the Gulf of Maine to Florida. 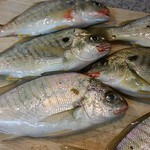 However, they are most abundant from Chesapeake Bay south to South Carolina. They have been collected from the main stem and all tributaries of Chesapeake Bay. Maximum length of spot is 14 inches. Spot mature at ages one and two and lengths of seven to eight inches. Adult spot migrate seasonally, entering bays and estuaries in the spring, where they remain until late summer or fall when they move offshore to spawn. Spot often congregate over oyster beds. Adult spot are primarily found in 5 parts per thousand or higher salinity, while juveniles are found in estuaries all the way to freshwater. Primary nursery areas for juvenile spot occur in low salinity areas of bays and tidal creeks, but they can also be found associated with eelgrass communities. Spawning occurs in offshore coastal waters from fall to late winter. Females produce at least 70,000 - 90,000 eggs per year. After spawning, adults may remain offshore, whereas larval spot will enter the Bay as early as December and appear in nursery areas in April and May. Spot is an important commercial and recreational fish species in the Chesapeake Bay. Currently there is no size or creel limit for spot. For the most recent recreational size and creel limits, see Maryland's updated regulation page. Spot are known for the croaking or drumming sound they produce by resonating their large swim bladder. The Chesapeake Bay angling record in Maryland was caught in Tangier Sound and weighed 2 pounds. The largest spot ever recorded measured 14 inches in length and the oldest was 5 years of age. For more information on spot and their management, please check the ASMFC website www.ASMFC.org (look for spot in the Managed Species section) or contact Harry Rickabaugh.